Graduating 3Ls have continued access to Lexis upon graduation to keep their skills up to date and use for job and interview preparation. The Graduate Program gives extended access to Lexis Advance to spring graduates via their law school IDs through December 31, 2019. This ID also grants them access to the Graduate Home Page and gives them a graduation gift (detailed in the flyer). The transition from a regular law school ID to a graduate ID happens on July 5, 2019. Read the flyer (linked below) for more information, including special services for those employed by a 501(c)(3) organization. With the seconds ticking down to exam time you can feel the panic start to set in as your heart begins to race and your stomach starts tying knots like an Eagle Scout. But it’s going to be OK! All you need to do is follow the below steps and you will be back up and running in time to still own this final! Step1: Right click the Examplify icon on your device, from the menu options, choose Run as Administrator. That’s it, this should fix the problem for most users. However, if you receive the same error message, proceed to Step 2. 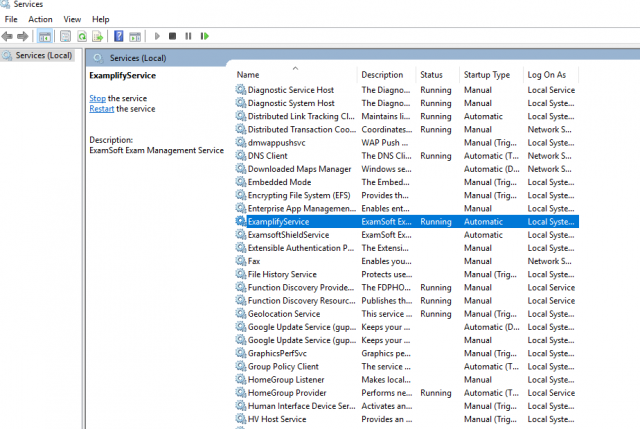 Step 4: Double click the ExamplifyService. This will open up a new window. Ensure that the Startup Type is set to Automatic. Step 5: Click the Start button on the left. After this service starts, Examplify will open as normal. 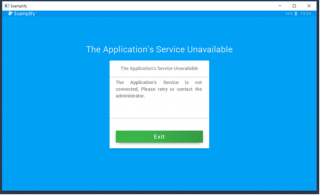 Note: If the service is not listed, you will need to re-install Examplify and/or check your antivirus settings to remove it from the quarantine. Now go conquer this final exam! If you find yourself in a similar situation with the same error message, or worse, your Examplify simply won’t launch at all and just bobs up and down without ever loading, then your solution is similar. Step 1: Simply create a new user profile on your computer. Make sure the new user profile is set as an Admin (Administrator) – For instructions on how to create a new user profile, please visit Apple’s support page for setting up new user accounts. Step 2: Log into the new profile and launch Examplify. See examsoft.com/support for additional information. Being a Pepperdine student has a variety of perks, ocean view, Olympic swimming pool, close access to the beach, and now free access to the power of Microsoft Office tools like Word, PowerPoint, and Excel. That’s right, Free. As you have probably noticed by now, there comes a time in legal writing when all the other free services like Google Docs or Pages simply won’t do. Maybe it’s when you tried to write your first Closed Memo, or maybe you made it all the way to your first Appellate Brief… but sooner or later you just realize you need Microsoft Word. If you are one of those people who want Word, PowerPoint, or Excel but never wanted to pull the trigger and pay the steep price for it, well now you don’t have to. As a Pepperdine student, you can sign up for free access to Microsoft Office 365. Simply go to the Microsoft online store and enter your Pepperdine email address, then follow the prompts to set up your free account and that’s it! Simply download the Desktop apps to your computer and you will be writing in style in no time, and did we mention for free? For more helpful tech info, visit Pepperdine’s Tech Central. Thanks for being a Pepperdine Law student and we hope you enjoy your free Office with an ocean view. First-time exam taker? Did you get a new computer since your last exam period? Have you recently upgraded your laptop operating system? Don’t forget to download ExamSoft to your computer for Final Exams! ExamSoft Worldwide produces the Examplify examination software used by many law schools and state bar examiners. This software is a secure essay exam word processor. Pepperdine School of Law allows students to use this software to take their mid-term and final law exams. If you plan to use your laptop computer to take your exams, Examplify is required. The majority of students currently take all or some of their exams via this program. 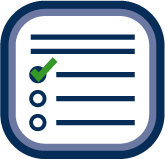 For more information, check out Examsoft’s Exam Taker Guide for everything you need to know about using Examplify. 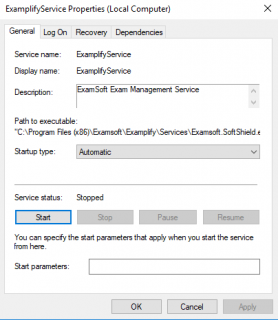 ExamSoft Releases periodic updates to Examplify that update to your computer automatically, overnight. These updates include general Performance Improvements and Software Bug Fixes. Most often, students do not notice the changes. For information on the current updates, you can visit the ExamSoft Support page regarding Releases. Interested in recording your class? 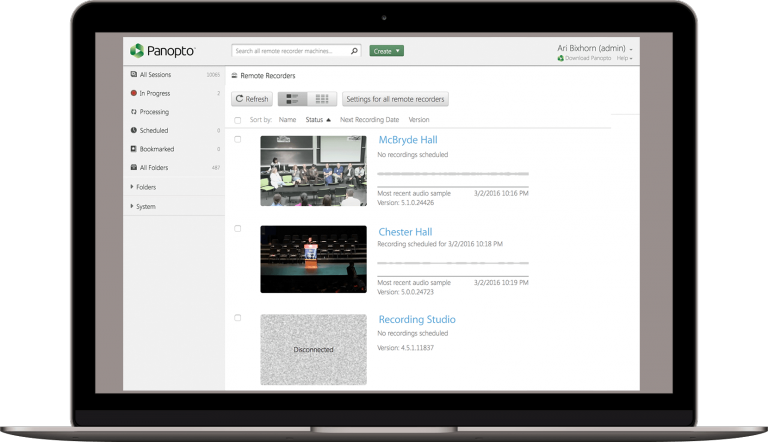 Panopto is Pepperdine University’s lecture capture system. The software is installed in every classroom and is simple to use. If you plan on recording your class more than once a semester, please contact support@law.pepperdine.edu to request an account. You’ll get your recording links emailed to you automatically if you have an account. Primary Screen– records any applications you use on the class computer, such as Word Documents, Web pages, Excel Files, TWEN Course page, etc. ExamSoft has just announced that it will begin supporting the new Mac OS X.10.14. You may now upgrade to the newest Mac OS X.10.14 Mojave version, which will be compliant with the latest version of Examplify. As always, please confirm that you have the latest version of Examplify by opening Examplify and checking the top bar of the window for the version number. The latest version number is 1.7.4. For more information, please visit the ExamSoft website. As always, stay tuned to lawtech.pepperdine.edu for more important updates regarding ExamSoft, or consult the ExamSoft website to ensure you stay current with all the latest news regarding your Examplify exam software. 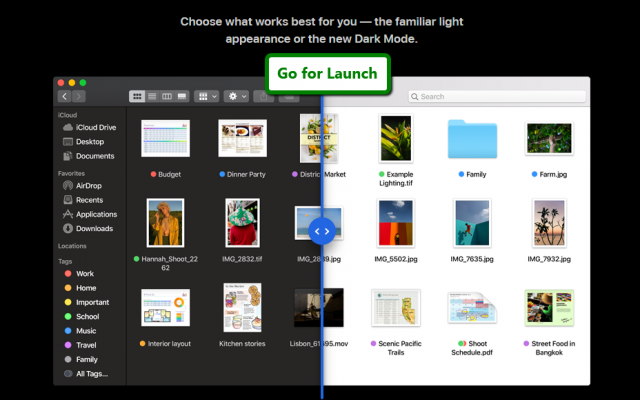 The new Mac OS has a variety of new features and improvements, including the new Dark Mode. Hope you enjoy! Register Your Password at Lexis-Nexis Instructions: In order to use Lexis-Nexis or Lexis-Nexis Advance, you will need to first register your activation code. You should have received your activation code at Orientation or via email (your Pepperdine account). If you feel that you have not received an activation code, email gilbert.marquez@pepperdine.edu with the subject line: LEXIS NEXIS ACTIVATION CODE. Additional Lexis-Nexis Resources: On the Lexis-Nexis law school homepage you can find tutorials and webinars that cover a variety of Lexis related topics. The tutorials are only 5 minutes long and the webinar recordings are from live events hosted online for students. They cover a variety of topics and range from 45 minutes to an hour. CALI [The Center for Computer-Assisted Legal Instruction] is a resource provided by Pepperdine School of Law for students that includes over 1,000+ interactive online tutorials written by law professors, on over 40+ subject areas. This includes, but is not limited to topics such as, 1L-First Year Lessons, 2L-3L Upper Level Lessons, Administrative Law, Tax Law, Constitutional Law, Legal Research, Property Law, Civil Procedure, and Environmental Law. These interactive tutorials are an excellent resource to enhance your studies. You may find that one or more of your professors will require you to use CALI lessons in the course of your studies. CALI Registration Code: In order to take advantage of the CALI interactive online tutorials, you will need to register with the CALI service. You will need the institutional registration code to do so. The Pepperdine School of Law CALI registration code is available in the Law Library at the Computing Support Desk at the Public Services Desk. eLangdell: Free eBooks for Legal Education – before purchasing textbooks, consider checking out this resource to see if your textbook is available for free. (1) Send an email to webmaster@CALI.org with your name and a non-Hotmail email address that you wish to use with your CALI account. The switch over will have to be done manually, so it’s entirely foreseeable that the process may get clogged up. If you want instant gratification and access…. (2) Create a new account using a non-Hotmail email address. Please note, if you do choose this option, you will lose all access to previous lesson run information. You will also need to obtain a valid authorization code. Speak with someone at the Computing Support Desk at the Public Services Desk for this information. In our digitally-connected world, it seems everything requires access to the internet now. Laptops, gaming devices, TV’s Bluray players, refrigerators, microwaves, toasters, pencil sharpeners… Ok maybe not Everything, not yet anyway. But all that connecting does make you wonder, “How do I connect all my stuff in on-campus housing?” Well, we have a few tips for you to follow. If you have a laptop, desktop computer, tablet, or mobile device (smartphone) simply turn on your WiFi and choose the ‘pepperdine’ network from your list of available network options. Then open any browser and navigate to www.pepperdine.edu and follow the “Faculty, Staff and Students” connection prompts to register your device on the network and connect. You will need to know Wavenet ID and password so be sure to have this information readily available or memorized. If you have friends visiting who wish to know how to access the internet, follow the instructions on Pepperdine’s Connection Page to help get them connected. Well, that part was easy, but what about a TV or streaming device? If your device has a web browser you can connect the same way as a computer. However, if your device does not, then follow the below steps. Select the Pepperdine network from your system’s network settings. Use your computer to access wavesconnect.pepperdine.edu and accept the use policy. 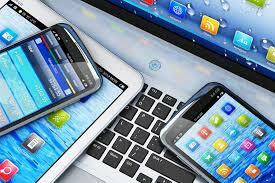 Choose the “Non-browser Devices” link and follow the instructions at that page. If those don’t work, check out the University’s WiFi FAQ page for more tips. 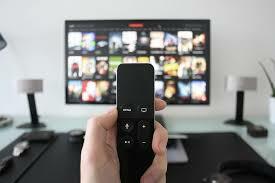 TV and Internet streaming is available on your TV or streaming device via the University’s partnership with Philo Edu. For more information on how to connect to this service, check out the School of Law Housing Page. Lastly, be sure to review all Rules of Wireless usage to make sure you are being a good wireless neighbor to your fellow WiFi users. TIP: Devices that put off their own WiFi networks like wireless printers and routers are prohibited on campus as it can jam the network signal for other students.